Meet Eric Barron: The Board of Trustees will hold a special meeting at noon today to consider the appointment of the university’s 18th president, and all signs point to that person being Florida State University president Eric J. Barron. If you haven’t already seen it, our Lori Shontz ’91, ’13g put together a terrific primer on Barron—it’s well worth a read. And to follow the action as it happens today, the board’s public meeting will be streamed live at WPSU, followed by a press conference and interview with (we assume) Barron and WPSU’s Patty Satalia, which will also re-air Monday night at 8 p.m. In the Pink: The Lady Lions played their annual Pink Zone game Sunday, knocking off Wisconsin, 78-68, at the BJC. 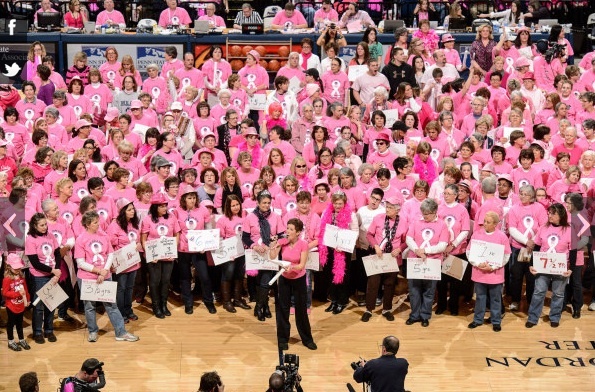 Nearly 700 of the 12,585 fans at the game were breast cancer survivors, and they celebrated an estimated $197,000 raised toward cancer research. Also worth celebrating: Another win for the Lady Lions, who improved to 20-5 overall and stand ranked 11th in the nation. It’s THON week: The Collegian has a cool feature on Taylor Bradley, a Penn State junior who serves as a family relations captain for THON. The especially cool part: Bradley herself is a leukemia survivor and former THON kid. Great stuff. Entry filed under: Board of Trustees. Tags: Lori Shontz, Pink Zone, Taylor Bradley.